Korhogo is one of the cities of my heart. Indeed, when I was young, I have realised several trips with my parents. This new stay remembers me good memories of my childhood in Korhogo which means “Heritage” in senoufo language. Korhogo is the 4th city of Côte d’Ivoire on terms of inhabitants and economy. Placed in the North of the Côte d’Ivoire at (….) miles of Abidjan, Korhogo is the headquarter of the Savannah District and the Poro Department. I leave Abidjan early morning at 7:00 am. The travel was fine and we arrived at 2:00 pm at Korhogo. After identifying our hotel, we ate “choukouya” whish is braised sheep. After this lunch break, we are going to Handcraft Village for meeting the painters and sculptors who create senoufo handcrafts products. J’ai donc quitté très tôt Abidjan aux alentours de 7h00 du matin. Nous avons bien roulé puisque nous sommes arrivés vers 14h à Korhogo. Après nous être installé, nous avons mangé du « choukouya » qui n’est autre que du mouton grillés. Apres cette petite collation, direction le Village artisanale pour rencontrer les peintres et les sculpteurs en pleins travaux. Ils confectionnent des produits d’artisanats sénoufo. Then we are going to Ouaragnegne, the village of weavers. On the road we made a stop in the cotton fields. A l’issue de ce petit moment, nous avons pris la direction pour le village de Ouaragnegne, le village de tisserands. Sur le chemin nous avons fait une halte dans un champ de coton. Our guide explains that Ouaragnene means « is not the fetish of someone ». He tells us that cultivators plant the cotton and after the harvest, the women spin the cotton for removing the first impurity. Once the cotton has been transformed into yarn by the women, men weave strips of cloth using their home-made weaving frames. This activity was open only to men. The women assemble the bands of fabrics for making a piece of fabric. 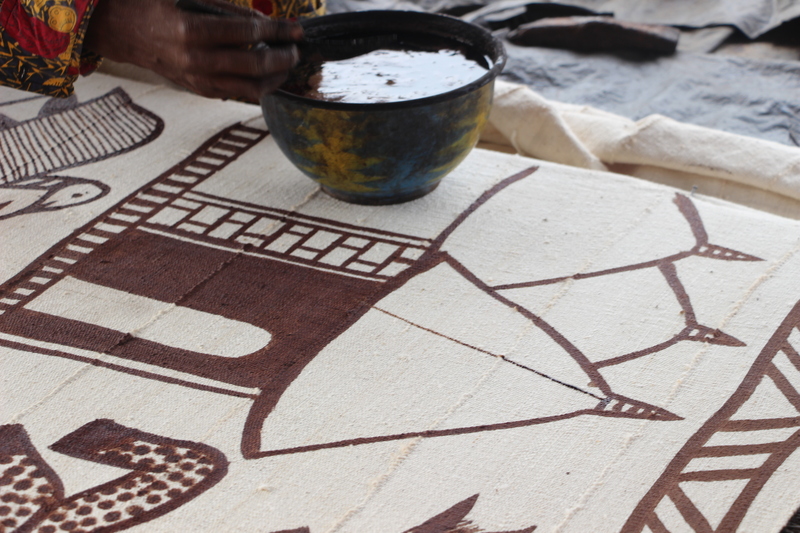 These piece of textiles are using for making clothing, home textiles and various acccesories. On the same site, we met the producers of pearls from Kapele Village. The pearls are making with natural clay and the color are all natural. Ouaragnene Signifie « n’est pas le fétiche de quelqu’un » selon le guide. Il nous expliqua que les cultivateurs plantent le coton et qu’une fois récolté, ce sont les femmes qui le filent après avoir retiré les impuretés. Ensuite une fois que le coton est transformé en fil par les femmes, les hommes tissent des bandes avec leurs métiers à tisser artisanaux. Cette tâche est uniquement réservée aux hommes. Nous avons pu faire une rencontre avec des fabricants de perles venant du village de Kapele. Elles sont réalisées à base d’argile et les couleurs sont toutes des pigments naturels. 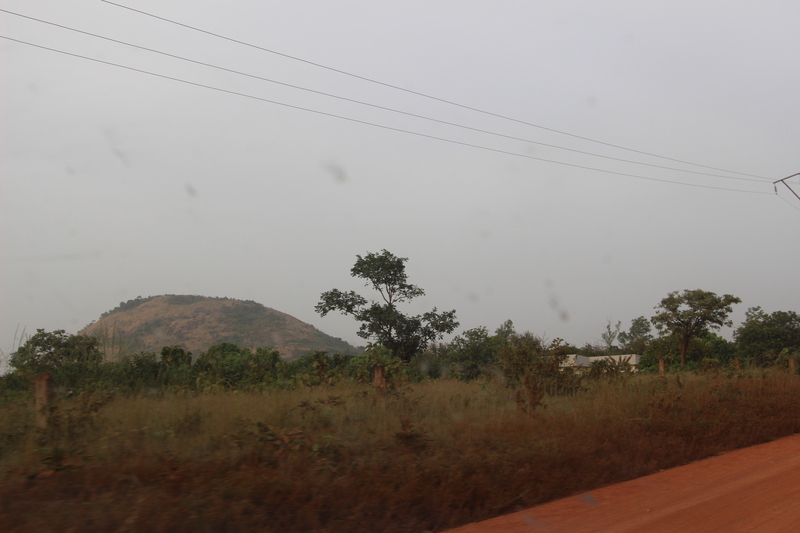 On the way back to the hotel, we saw the Mount Korhogo. A mountain of 2000 meters of altitude that I climbed several times in my childhood. It is a beautiful stroll that gives a beautiful view of Korhogo and its surroundings. 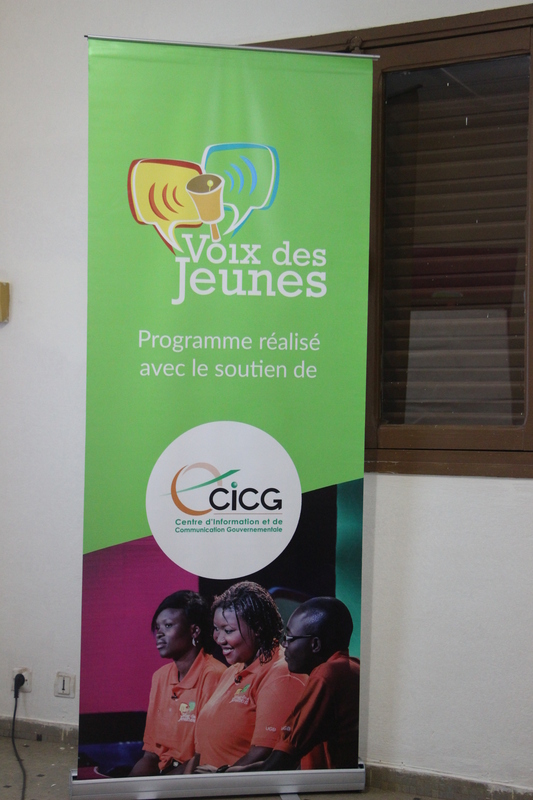 After a small refreshment, I started the workshop of the Bootcamp for the young people who participated to « Voix des Jeunes » project. It was a great moment of exchanges. Après un petit rafraichissement, l’atelier du Bootcamp pour les jeunes qui participent au projet Voix des jeunes débuta. Ce fut un beau moment d’échanges. The next day, I left Korhogo around 10:00 am to go to Abidjan. On the road we made a stopover between Bouaké and Yamoussokro in a small roadside market. After some shopping and a good part of fun with the saleswomen, we are off again for Abidjan. Le lendemain, je quittais Korhogo vers 10h00 pour me rendre à Abidjan. Sur la route nous avons fait une escale entre Bouaké et Yamoussokro dans un petit marché de bord de route. Après quelques achats et une bonne partie de rigolade avec les vendeuses, nous voilà reparti pour Abidjan.